If you run into one of our fine local meteorologists, give 'em some love. They're probably feeling as down as anyone about our utterly uneventful winter weather, and now the majority of them have to live with knowing they predicted accumulating snow for the Twin Cities that essentially never materialized. And commuters, warned that they'd likely need extra time because of weather delays, potentially lost a little shut eye based on the forecasts. This was, by most assessments, a bust-o-rama. WCCO: B WCCO was the least gung ho on accumulating snow for last night and this morning. 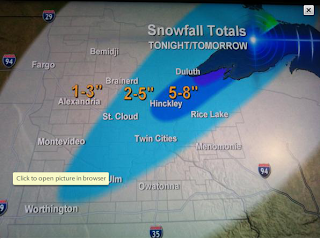 While WCCO viewers weren't lead to believe there'd be much snow, they were also lead to believe there'd be at least a little. 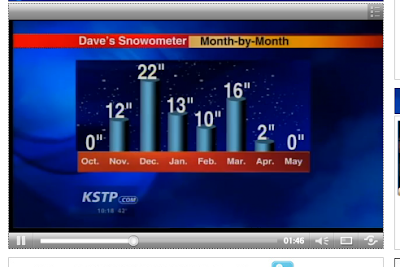 KSTP: D Forecast of 1-2 inches of snow meant they were 1-2 inches off. They were also slow to remove any chance of accumulating snow from the forecast, providing for at least the possibility of some as recently as mid-morning. 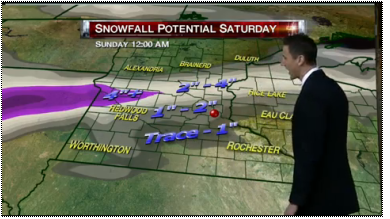 FOX: D- Steve Frazier's unabashed love of the "snow meter" not withstanding, FOX seemed to predict 1.5 to 2.5 inches of snow. 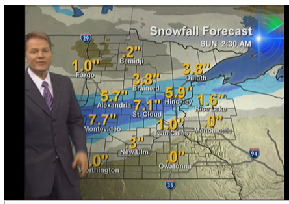 KARE: D- KARE predicted 1 to 3 inches, with 3 inches being the exception. In fact, 1-, 2- and 3-inches were all the exceptions. 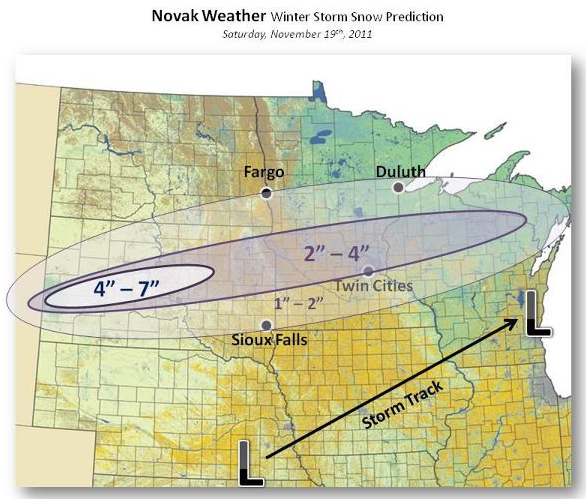 Strib and NWS: F Predicted 1-3 inches. Need we say more. MPR: B- MPR was on the right track with this storm, predicting a coating to an inch for the urban core. But there was no coating to be seen, at least if you lived in the shadow of MSP airport, the official measuring station. If these were awards, we might give MPR an honorable mention. 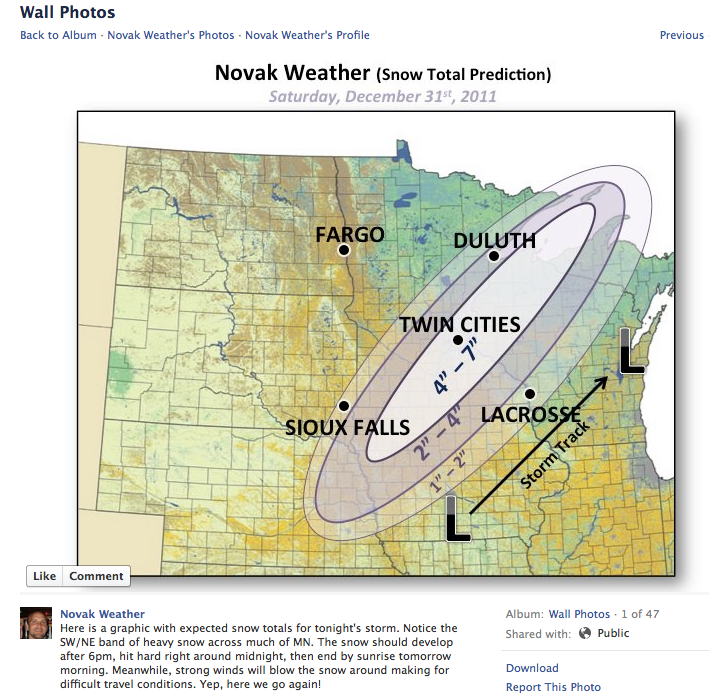 @NovakWeather: F With the most ambitious snow forecast, TMF's advising meteorologist was off on this one. But we're pleased to hear he's already dusting himself off and read to battle for another day. Keep the faith, Tom. The Weather Channel: C- Comparatively speaking, TWC fared somewhat better than the local weather gurus, but they still predicted around one inch of white stuff that never came. Accuweather: F Inaccuweather. Need we say more? WCCO: Noncommital. 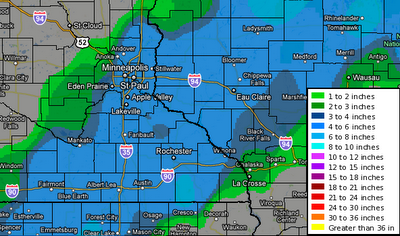 Seemed to suggest that accumulations would be south and southwest of Twin Cities. The Weather Channel: Snowfall around one inch. 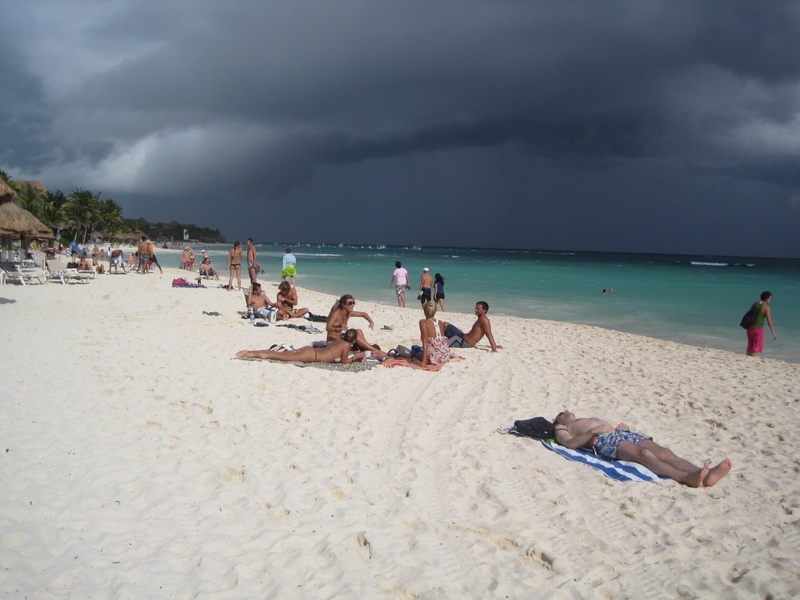 Forecasters are finding the weather pattern to become more active. Use this space to talk amongst yaselves! As snow lovers and winter weather enthusiasts wait for "interesting" weather to come through the region, it's been suggested that we use this break in the action for followers and weather enthusiasts to post their favorite weather sites, links, etc. 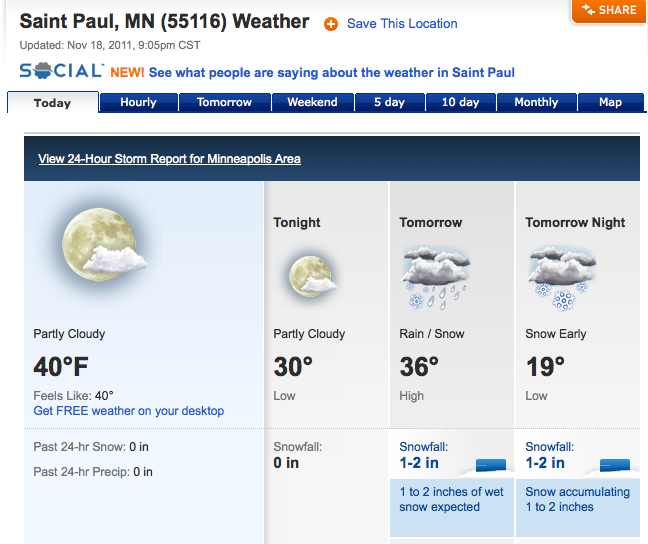 If you're inclined, provide some of your bookmarked favorites so we can share the weather love. In the meantime, we'll all keep scanning the horizon for something, anything that's interesting. As of Wednesday evening, there remains great uncertainty about what will actually happen on Saturday. 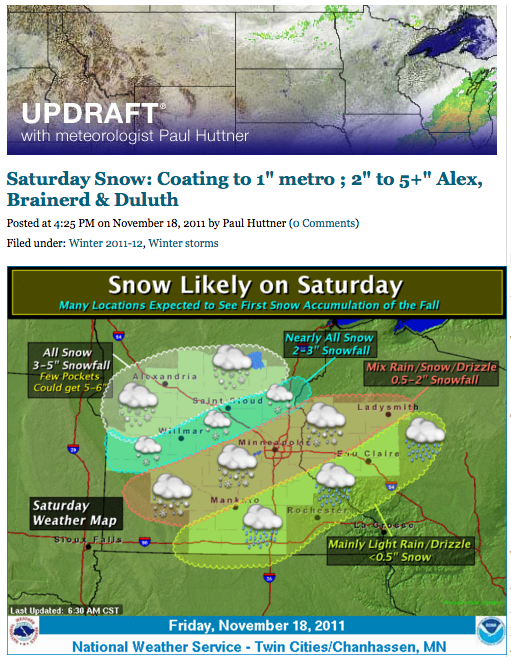 Weather.com reflects "up to 6 inches of snow" whereas some of the local outlets are thinking it will be more wet than white. 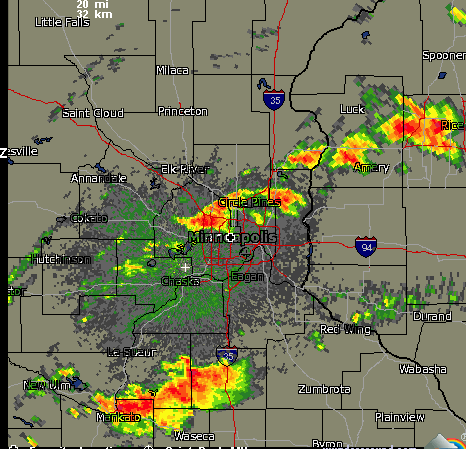 And is this really much of a storm at all or is it just that Minnesota weather enthusiasts are starving for something to talk about? The Boring November Continues ... Storms, Cold in Sight? 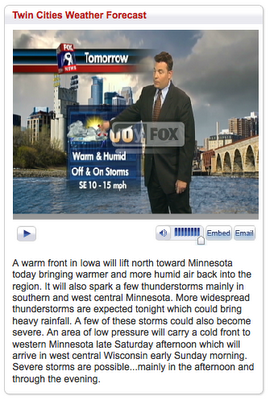 Minnesota's weather enthusiasts haven't had much to cheer about in several months. Through mid-November, it's been dry and mild. Some think the weather may get interesting the weekend of Nov. 19-20; others think the boring weather will continue through at least Thanksgiving. What says you? The local weather Twittersphere has been filled with talk about a possible snowstorm for the middle of next week. 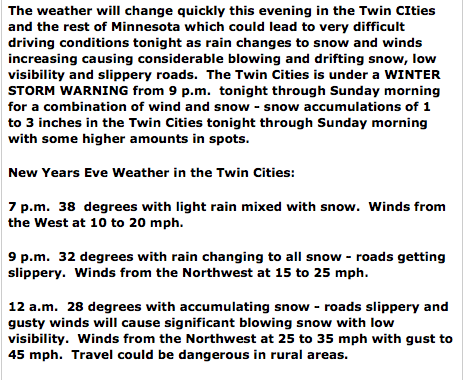 As of this writing, most forecasters seem to think it will pass southeast of the Twin Cities. 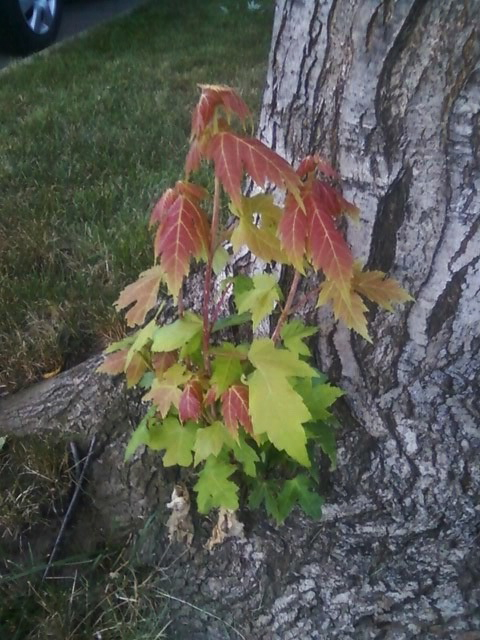 What do you think/hope will happen? KSTP's Dave Dahl released his forecast on October 27 and predicts 75 inches of snow for the Twin Cities. Even better, Dave laid out his snowfall projection by month. We're inclined to think he nailed the October snowfall forecast. 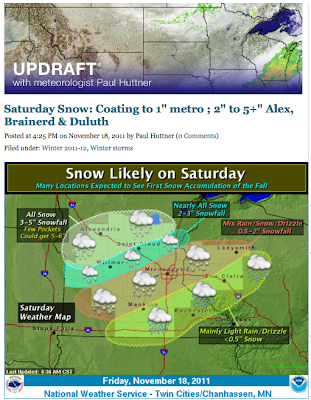 MPR's Paul Huttner weighed in with his forecast on October 26. He forecasts average temperatures for the December through February period and a seasonal snowfall total between 50 and 60 inches. The Star Tribune's Paul Douglas calls for winter temperatures to average 3 degrees cooler than normal and snowfall to total between 50 and 55 inches. 61.9 inches. Please take the poll at right to tally your guess as to how winter's temperatures will fare. 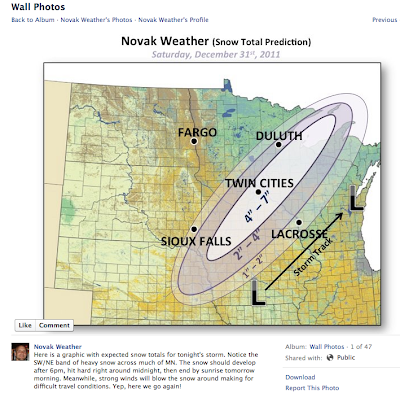 Minnesota Forecaster, whose predictions are based on the amount of shedding experienced by the family dog, predicts temperatures averaging .6 degrees above normal with seasonal snowfall of 43.1 inches breaking down as follows: October: 0, November: 4.1, December: 10.7, January: 9.2, February: 4.1, March: 11.2 inches, April: 3.8. 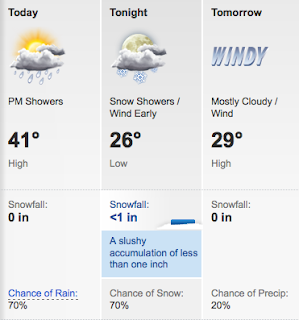 Readers, are there any other forecasts out there that we may have missed? “I thought I would try a systematic approach to this,” says Rigil. “I took the average snowfall of the La Nina winters, plus a random correction taken from the statistical distribution that best approximates winter snowfall in the Twin Cities since records started.” Rigil came up with a result of 62.1 inches of snow. 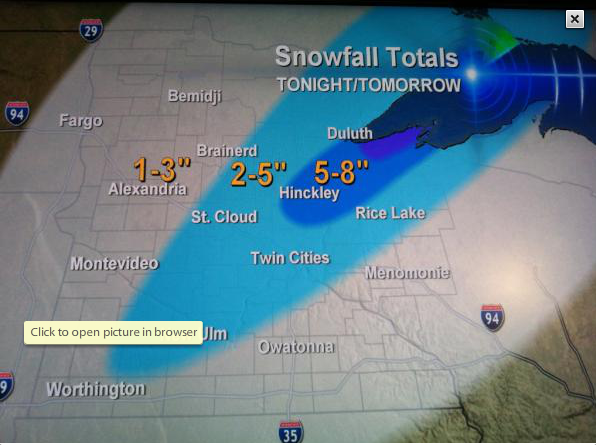 A reminder that you can follow The Minnesota Forecaster on Facebook and Twitter. The answer, of course, is how the heck do we really know? Ah, but that won't keep the weather-obsessed populace that is Minneapolis/St. Paul from wondering. And with that, we were wondering what your thoughts were regarding the upcoming winter. Please take the poll at the right. 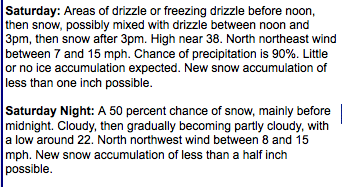 What does the NWS say about this winter? 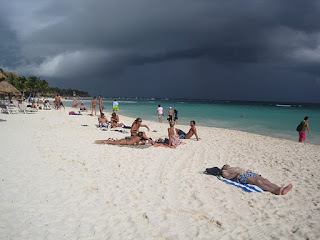 It is true that there are signs of a La Nina returning for this winter out in the equatorial Pacific. About 70-80% of the time there is a La Nina, temperatures in MN for the Dec/Jan/Feb 3-month season are below normal (with about 60-70% of those winters experiencing above-normal snowfall). The Climate Prediction Center shows the historical correlation to the ENSO phase and temp/precip patterns across the US at this site. Our own guess -- based on gut, not science -- is for average temperatures, slightly below normal snowfall and one to two short tropical getaways. What are your gut thoughts on the winter ahead. Will it take a while to get going? Will it start with a vengeance? Will it feel like a St. Louis winter? The National Weather Service forecasts a high of 90 on Monday ... and a low of 39 for Wednesday night. Yowser....How do you feel about this sobering development? Misleading headline. It won't. But keeping with our mission of evaluating weather forecasters, this can be a space for comments about forecasting for Hurricane Irene. Dave Dahl appears to be the first local forecaster to put out a forecast for the state fair. The following appeared on the KSTP weather blog in the late afternoon of Tuesday, August 16. Highs will probably climb quickly through the 80s and into the 90s by the start of the Minnesota State Fair. Right now it looks as though we'll have the average amount of rainy days during the Fair, which means we can plan on around 3 of the 12 days to be a little wet. Anyone else have an educated guess on the state fair weather? 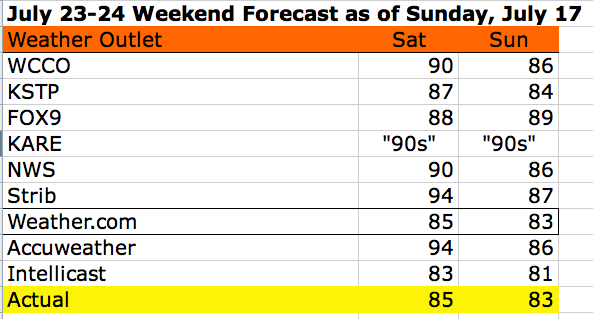 We did another extended weekend forecast analysis for this past weekend's weather (Aug. 6-7) as predicted on the night of Sunday, July 31. There were no clear winners for the forecast and what seems most noteworthy is that none of the weather outlets latched on to the 6-degree decrease in temps that occurred from Saturday to Sunday. This morning provided another reminder that, in our eyes at least, tweeting meteorologists are putting too much predictive emphasis on emerging radar echoes and, in their efforts to be precise, forgetting that storms die out, rebuild and change directions. At a minimum, they'd be wise to at least use more cautionary wording like "may" or "if it holds together" when discussing the movement of storms seemingly headed for the metro. This morning, Sven Sundgaard detailed with seeming certainty the arrival of morning storms per the graphic below. With our hopelessly untrained eye, we looked at the radar shortly after 7 and wondered if that would actually happen. For one, the storms were a relatively long way away (though moving very quickly) and it seemed puzzling that one could speak with such certainty given the distance the storms still had to travel. For the fun of it, we tweeted close to 8 a.m. that we had our doubts. But it wasn't until close to 9 a.m. that Sven acknowledged that the storms indeed were going to miss the most of the metro. 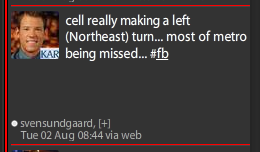 Tweet issued at 7:07 a.m. 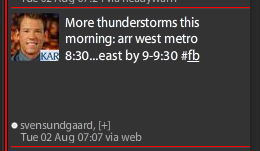 Amateur tweet at 7:59 a.m.
Tweet issued at 8:44 a..m.
Conversely, we did note that Jonathan Yuhas, whose tweets were off the mark during the day and evening of the U2 concert employed wording that acknowledged merely the possibility of storms arriving in the metro. It's baffling to us why many forecasters continue to make pronouncements of impending storms in such certain terms, particularly when storms are still a decent distance away. Why not use tweets to put us on alert and then communicate with more certainty when storms are truly on the doorstep. Doesn't that make more sense? By this time, everyone knows that this was one of the bigger weather busts in a while. And, it was unanimous, so there's no point in comparing the performance of individual forecasters. No weather outlet suggested anything close to what happened today -- both in terms of forecast temperatures and the timing and coverage of the storms. It even seemed that the morning nowcasts somewhat missed the boat. 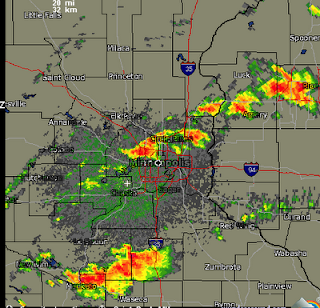 When it became apparent that storms loomed with greater significance than expected, several forecasters anticipated a mid-morning arrival of the storms, when in fact it seemed they held back a bit to produce a stronger punch shortly after noon. No mention of today's forecast evaluation could go without noting the irony of the coolest day in the last week being the one where an official heat advisory was issued. For that matter, it seems the NWS really should have issued a heat advisory for yesterday, when heat indexes were truly oppressive. Any professional mets out there have any thoughts on what happened from an informed, meteorological perspective? Did the warm front take longer to come through? What materialized that wasn't anticipated by the beloved models? We thought that this forecast had a fair amount of challenge because there was a major heat wave that was about to hit high gear early in the week for a somewhat uncertain duration. 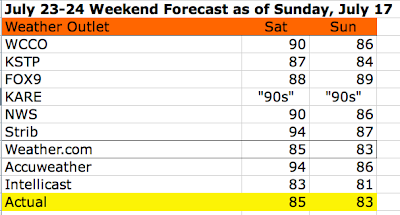 The following table summarizes the forecast error for each of the weather oulets (we arbitrarily used 92 as the predicted temperature for Saturday and Sunday for KARE). There's not all that much to take from this. It is, after all, just a one-weekend extended forecast sample. Were we do to this for every weekend over the course of a longer time -- months to a year -- the results would be a lot more meaningful. Also, and just as importantly, we didn't record the forecast as it related to sky conditions/storms, etc. Twin Cities forecasters are talking about the possibility of severe storms on Saturday, which means Twins fans and U2 fans can't rest easy. Weigh in with your thoughts here. Will Wednesday Provide the Century Icing to the Heat Wave Cake? Widely Predicted Heat Wave Finally Arrives in Earnest. Eighties or 90s Next Weekend? Heat wave update as of 4 p.m.
Until today, the heat wave that was so universally predicted for so many days didn't pack the punch we were led to believe. Today, the forecasts came true. For the first time in many days, the forecast high temperature and heat indexes were reached, and even exceeded. By late afternoon, the heat index of 112 in Minneapolis was the highest of any major city in the U.S. Take a bow, y'all. Here's a summary of how the heat wave is "performing" against forecasts made on Friday night. Here's a summary of the over (under) prediction of the heat wave to date for the period since Friday night. At this juncture (and assuming the 98-degree high for Monday holds), KARE has the best forecast record for the period measured; Fox, the worst. 80s or 90s for Next Weekend? A funny thing happened on the way to that streak of 90s ... it hasn't yet begun. Despite universal forecasts of temperatures above 90 today, the temperature reached "only" 87. 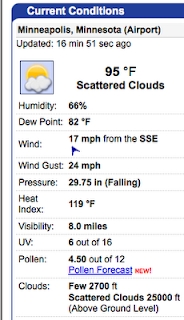 The highest heat index for the Twin Cities today was a not-off-the-charts 97. It seems questionable at best as to whether an excessive heat warning was really necessary. The 80-81 degree dew point predicted by the Star Tribune weather columnist also never materialized. 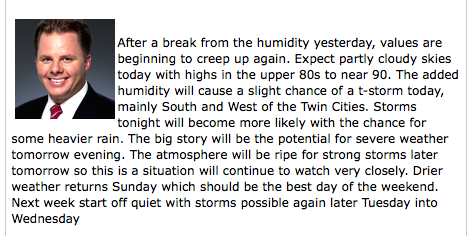 While the dew point did reach a tropical 77, it did not approach the record to near-record high dew point predicted in several recent Star Tribune blog posts. 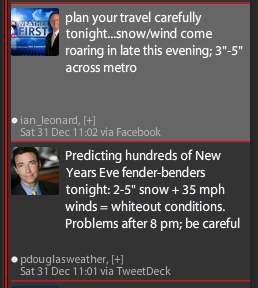 Perhaps you've noticed, but the weather gurus haven't been at the top of their game the last three days. The original prediction for heavy rain (to be measured in inches) was for Wednesday night into Thursday. Yet, Thursday saw only .13 inches of rain. The Friday forecast generally (and yes, we're generalizing about the forecasts) called for the chance of a few spotty storms and a high in the upper 80s. However, Friday saw the first bout of torrential rain (more than two inches) and a high of only 77. And as of Friday night, most forecasters called for only a small chance of rain overnight on Friday. 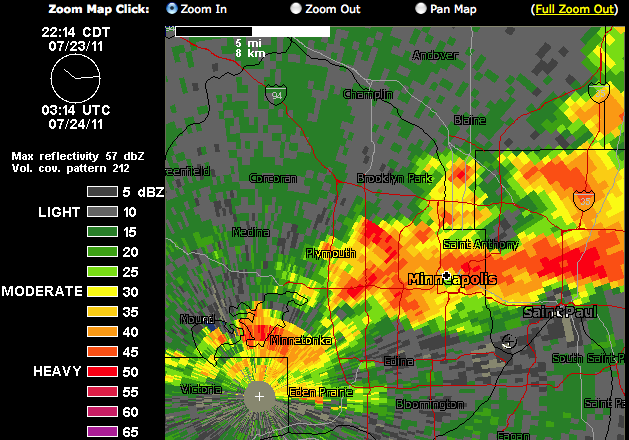 In fact, more torrential rain fell in the early a.m. hours of Saturday. 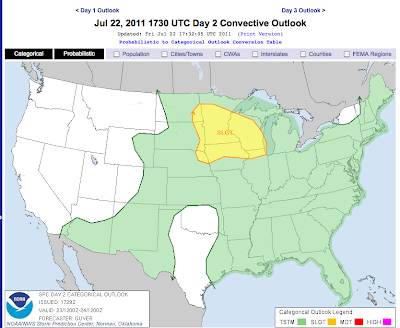 It all serves as another reminder that forecasting, particularly amid the chance of convective storms, is a tough task. 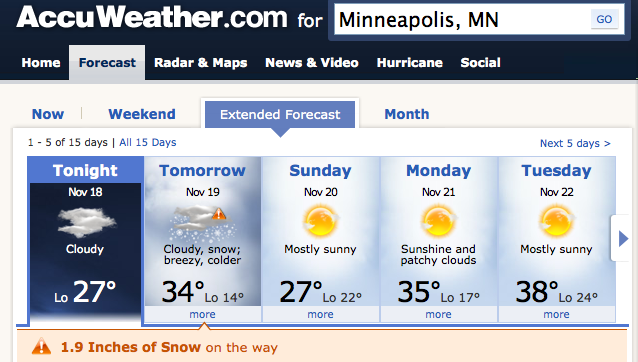 Weather.com is displaying an odd range of forecast temperatures for Sunday. It forecasts 96 for Minnetonka, 101 for St. Paul and 104 for Minneapolis, including the zip code for the Mpls/St. Paul airport. The official weather.com forecast is: Intervals of clouds and sunshine. Record high temperatures expected. Heat index near 120F. High 104F. Winds S at 10 to 20 mph. Here's an updated comparison of heat wave predictions made on Friday night to the actual temperatures reached so far. Note that all predictions for the first two days of the period have been well above actual. 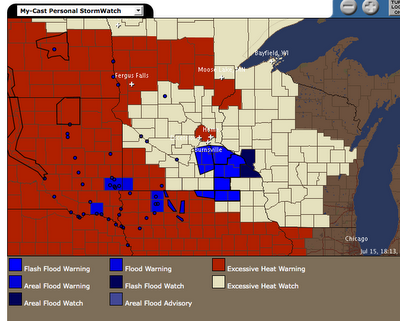 Here is a depiction of the latest heat watches and warnings. The red-shaded areas represent Excessive Heat Warnings; the lighter-colored shading represents Excessive Heat Watches. It makes some sense that the always-cooking urban core could be under a warning when surrounding areas are under watches. 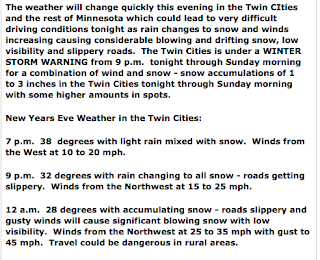 But what makes less sense to us is why there would be a warning for two counties (one in Minnesota, one in Wisconsin) that are midway between the Twin Cities in Duluth. Is the heat really expected to arrive in such an unusual arc pattern? Or is the thinking that the two counties didn't receive much rain today and thus will heat up faster? Hmm.... Professional meteorologists, what can you tell us? Interestingly enough, the greatest amount of variability in the 7-day forecast is for today. Blue outline marks forecasts that (sort of) stand out as being cooler than others; red outline marks forecasts that stand out for heat. If you're not desiring a heat wave, you should be rooting for the Intellicast forecast, which "only" forecasts five consecutive days in the 90s. The following information is based on forecasts collected this Friday morning. Update: As of Wednesday night, here's how forecasters saw the upcoming heat wave (Saturday through Wednesday). 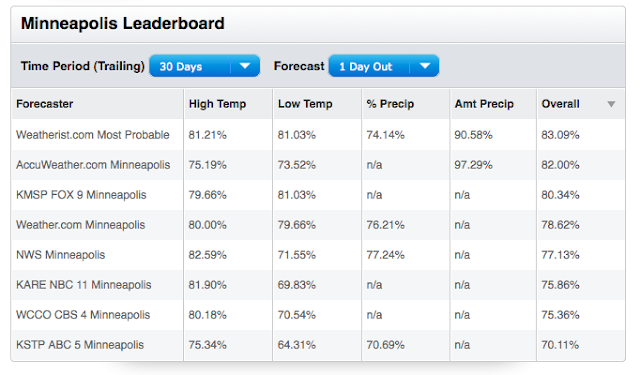 Note that KSTP, as it often seems to be, forecasts the highest temperatures, with an average heat wave temperature of 97.4 for the five-day period.